WATERTOWN — Mary Jeanne Selby, 65, wife of James Selby, passed away peacefully at her home. 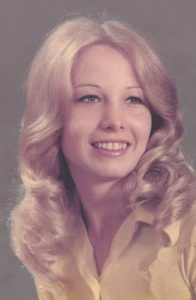 Mary was born on Nov. 16, 1953 in Waterbury, a daughter of Mary (Laguna) Kevit and the late Charles R. Kevit Jr. She graduated from Naugatuck High School class of 1971. She was an accomplished swimmer for NHS and the AAU. She was a manager at Kmart and a past president of the Ladies Auxiliary American Legion in Watertown. Mary was an avid reader and loved cats, mystery movies and poetry. Mary is survived by her husband James of 33 years; her mother, Mary Kevit; her stepson, Stephen Selby (Reina); her stepdaughter, Meredith DeSanto (Mark); her sister, Doreen Mayconich (Tom); her brothers, Gary Kevit, John Kevit (Lisa); her sister-in-law, Linda Kevit, and three grandchildren. Mary now goes to join her father, Charles Kevit, and her brother, Chuck Kevit. There are no calling hours and all services will be held at the convenience of the family. Arrangements have been entrusted to the Buckmiller Thurston Mengacci Funeral Home. Memorial donations in Mary’s honor can be made to the ASPCA, PO Box 96929, Washington, DC 20090-6929.